India is the 9th country to manufacture Toyota hybrid vehicles. The petrol Camry, the legendary cornerstone of Toyota brand, was first introduced in 2002, in India. In 2012, TKM began locally manufacturing the petrol Camry. 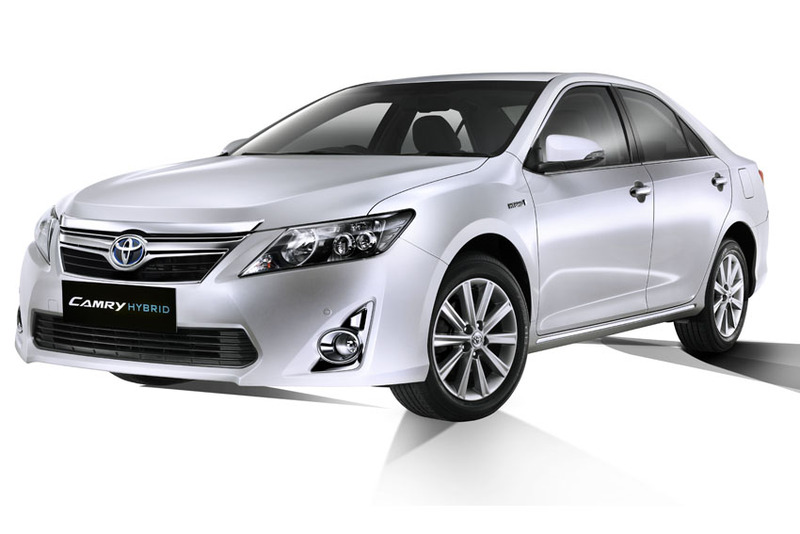 Like its petrol counterpart, the New Camry hybrid is based on the 7th generation of the Camry. Aptly named Hybrid which means 'fusion', the Camry hybrid combines a newly developed hybrid exclusive 2.5L beltless petrol engine with an electric motor. The vehicle runs on Hybrid Synergy Drive, which intelligently senses when to switch between the two power sources - petrol engine and electric motor. It controls the engine and motor output for optimum fuel efficiency. The battery supplies electricity to the motor, enhancing the driving power. The engine and motor together give an impressive total system power output of 205 ps. In addition to powering the vehicle, the motor is activated as a generator to convert the moving vehicle's kinetic energy into electricity. The generated electricity charges the battery. This process, usually happens at the time of decelerating and braking and is called regenerative braking. The vehicle gives an exceptional mileage of 19.16 kmpl*, the best in its segment. A testimony to its hybrid technology the car produces just 122.8 gm of CO2 emissions per km of driving, which is far lesser than the conventional vehicles of similar engine size. The Camry Hybrid comes with an Electronically Controlled Continuous Variable Transmission (E-CVT), which provides enhanced driving performance, with reduced fuel consumption and lower NVH. The all-new Camry Hybrid has been styled befitting a prestige sedan and is fully loaded with high-end luxury features. In addition to the features available in the petrol Camry, the Camry Hybrid comes with more than 35 enhancements. The ride experience is heightened by an extremely quiet ride, the vehicle is almost soundless, especially when you start it. The high density dashboard silencer material, acoustic windshield glass and the E-CVT further brings down the engine noise and avoids sounds from outside, entering the car. Like its petrol counterpart, the Camry Hybrid offers best-in-class cabin space, derived from the impressively designed wide body. The all-new Camry Hybrid is priced at Rs. 2,975,000 (ex showroom, Delhi) and is available in four vibrant colours - grey metallic, white pearl crystal shine, silver metallic and attitude black. "The Camry Hybrid is India's first locally manufactured Hybrid vehicle. Manufacturing the Camry hybrid locally, in India, marks a very important milestone in the history of TKM and the Indian automobile industry. It is our endeavor to offer the best vehicles with most advanced technology to India. Toyota is a pioneer in Hybrid technology and thus we were very keen to manufacture the all New Camry Hybrid in India, as well. This is in line with Toyota's global philosophy to encourage the use of hybrid vehicles across the globe, for a greener tomorrow. Manufacturing Camry hybrid locally will be yet another step towards Toyota's global commitment," said Hiroshi Nakagawa, Managing Director and Chief Executive Officer, TKM. "Toyota Camry, the globally renowned flagship brand of Toyota is further strengthened in India with the introduction of all-new Camry Hybrid. Toyota hybrid has a history of more than 15 years to its credit and over 5-million cars across the globe," added Sandeep Singh, Deputy Managing Director and Chief Operating Officer, Marketing and Commercial, TKM.